Our befrienders are volunteers who provide support to people with sight loss to enable them to enjoy social and leisure activities. They can help with anything from reading your post, getting out and about with confidence again, supporting you with a hobby such as golf or theatre trips and even running or walking guides! Typically, our befrienders and befrienders meet for a couple of hours once a week or fortnight but this is up to you and them to agree on. We have some befrienders who support people over the phone on a short-term basis. Usually, these volunteers have experienced sight loss themselves. 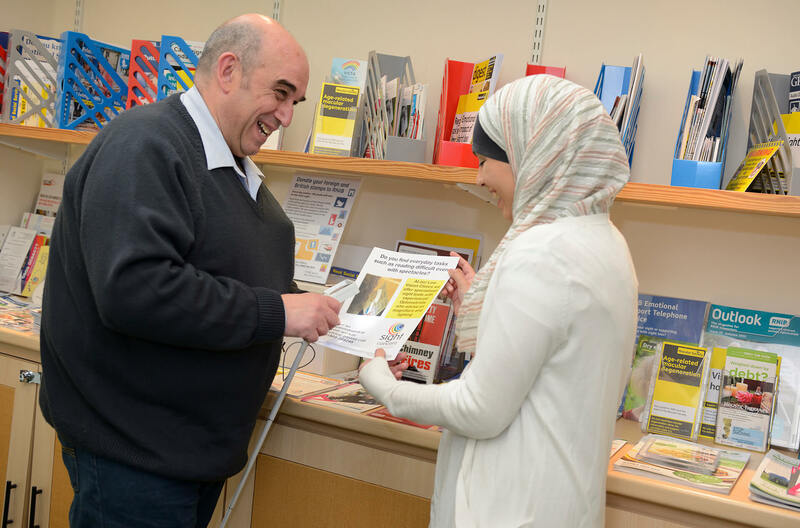 They are there to offer a listening ear and share their experiences, whether to offer encouragement if you are trying to get back into work, or to suggest useful tips and strategies if you have been recently diagnosed with an eye condition and are adapting to living with sight loss. Our befrienders are there to provide companionship and to support you in overcoming some of the challenges your sight loss might create for you. They cannot provide ‘services’ such as personal care, gardening or cleaning. It doesn’t cost anything to be matched with a befriender and we cover your volunteer’s travel to and from your home. However, if you wish to get out and about with your volunteer, we ask that you cover these costs yourself. We take care to match people who have similar interests and live close to one another so that the partnership is both enjoyable and sustainable for both parties. It can therefore take anything from a few weeks to a few months to find someone for you – but we will keep you updated until we do. Once you have been matched with a befriender, we will keep in contact with you and your volunteer to ensure you are both happy with the partnership and to offer any other help or advice if needed. What training and background checks do your volunteers do? All our befrienders go through our induction process before being matched with a befriendee. We take references and complete an enhanced DBS check (i.e. a criminal record check). They then attend our induction and Sight Loss Awareness course to help them to understand different sight problems, ways in which they can help and how to guide someone. You can find out more about our befriending service simply by contacting our office on 01905 723245 and asking to speak to our Volunteering Team or by emailing info@sightconcern.co.uk. If you decide you would like to request a befriender for yourself or someone else (provided you have their consent), you will be referred to your local Advice and Support Officer who will arrange to visit you to discuss your needs. You do not need to be registered blind or partially sighted to request a befriender. We are always looking for more volunteers to support others in their local community and we have a waiting list with a wide variety of requests from all around the county.